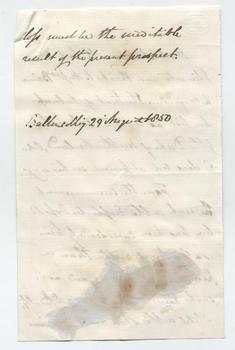 FRANCIS RAWDON CHESNEY Autograph Letter. British explorer. Noted for his navigation and exploration of the Euphrates River and Valley and his role in the planning of the Suez Canal. AL. 2pp. 29th August 1850. To Major Baine. 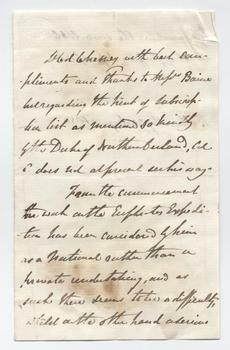 "Lt. Col. Chesney with best compliments to Major Baine but regarding the first [?] of subscription list as mentioned so kindly by the Duke of Northumberland, Col. C. does not at present see his way. From the commencement the work on the Euphrates Expedition has been considered by him as a National rather than a private undertaking, and as such there seems to be a difficulty which on the other hand a serious loss must be the inevitable result of the present prospect." 8vo. Approx 7.25 x 4.5 inches. Lacking integral blank leaf. Some creasing and browning and with some old mounting residue to verso. Francis Rawdon Chesney made his first surveys in Egypt and Syria in 1829-30 in the course of his military duties in the Royal Artillery. He submitted a report on the feasibility of constructing a Suez Canal. This became the basis for De Lesseps' undertaking and, in 1869, De Lesseps acknowledged Chesney as "the father of the Canal". Subsequently, Francis Rawdon Chesney began explorations to establish the possibility of an overland route to India via the Euphrates Valley and in 1836-37 he undertook a daring and dangerous journey which, after much difficulty and hardship, succeeded in reaching the sea at Bushire. He made further expeditions to the Euphrates in 1856 and 1862. He was awarded the Royal Geographical Society's gold medal. Autograph letters of Francis Rawdon Chesney are scarce.